All of the press and hype surrounding the music gear industry follows a similar pattern every year. New products get announced at NAMM in January, unleashing a wave of buzz that ripples through forums and YouTube channels, and ultimately into shopping carts of websites like Reverb.com. Smaller brands often release gear later in the year to less initial fanfare, building their reputations on merit rather than marketing. You see this a lot with boutique pedals and guitars where an off-the-cuff artist endorsement or a single demo video can do as much for a product's popularity as any trade show press release. Here is a look back at both the big releases and sleeper hits that generated the most buzz in the music gear industry in 2016. The Korg Minilogue was easily the most talked-about synth at NAMM this year, and a steady stream of praise has followed since. Analog synths are as en vogue as ever, and this portable keyboard strikes a perfect target zone in the broader market. It's analog, but not too expensive. Highly tweakable, yet extremely approachable. Korg understands the blossoming affordable analog market better than anyone and brings a unified vision of how to lower the barrier to entry for these machines. While it may not sound as juicy as vintage Juno or any modern Moog, the Minilogue represents a major step forward for Korg and claims a definite spot as the new entry point into the realm of analog synths. 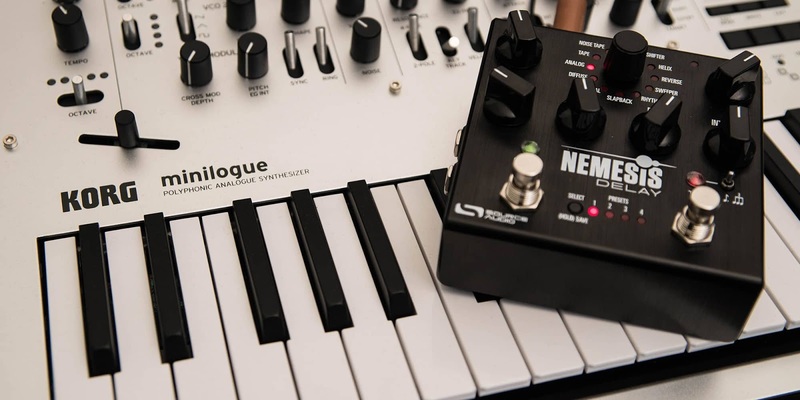 As a testament to how well the Minilogue is doing, Korg has a already announced a smaller follow-up – dubbed the Monologue – set for release next year. The Nemesis has been one of the highest selling boutique pedals on Reverb all year due to glowing reviews, forum-fueled reputation and, most importantly, undeniable versatility and sound quality. This pedal comes equipped with 24 effect engines along with an app for ultra-precise preset editing. The electric guitar market is more conservative than many other subsections of the gear world with a truly massive range of brands and models. This sheer breadth of selection means that any particular new offering rarely stands out from the crowd (with the exception of the occasional artist signature model). The new American Standard Offset Telecaster, though, is different. It's at once traditional and new, and intriguing enough that its announcement this year was met with all sorts of praise and enthusiastic expectation. As many pointed out, the Tele-Jazzmaster (aka Telemaster) hybrid concept is nothing new and has been a mainstay in the boutique guitar pattern book for years. This model, however, is the first time Fender has offered something in this mold as a regular production model for the masses. And the masses, it would seem, are ready to give it a whirl. Apart from the Minilogue, the Matrixbrute from Arturia was the other most talked-about synth at NAMM. As a brand, Arturia has always been great at merging old and new ideas, and bringing fresh perspectives to classic sounds. The Matrixbrute accomplishes this by taking a vintage Moog-esque architecture and adding features like an extensive matrix for routing and sequencing, as well as the ability to store presets over analog settings. It does this all at a price point that comes in at about half of what you'd expect to pay for a similar piece from other brands. It's been ten months since the original announcement of the Matrixbrute, and this sythn has still yet to hit stores. It's not an especially good look for Arturia, but the stream of videos and reviews hasn't stopped, only building anticipation within the synth community. Make Noise is one of the top names in the Eurorack community, with a lineup of extremely inventive modules and systems. With the 0-Coast, the Asheville firm has crammed an impressive variety of features and functions from their modular designs into a svelte, standalone package. Essentially, you get the experimental possibilities of a larger Eurorack system without having to buy the requisite rack of pricey modules. In this regard, the 0-Coast — named for its embrace of both East and West Coast synth design schools — is like the Moog Mother-32 which was released to much applause in 2015. Unlike the Mother, however, the 0-Coast is surprisingly not Eurorack mountable, meaning that you can't just screw it in along with your other modules despite its CV compatibility. It's an interesting choice for Make Noise, but certainly shows their commitment to creating a genuine all-in-one desktop system that captures their aesthetic goals as a company. Call it '80s nostalgia, or call it players running out of interesting things you can do with delay. Either way, chorus pedals have made a serious comeback the past few years, and the Boss CE-2W is a full-on throwdown of classic chorus sounds. As you may know, Boss literally invented chorus in the '70s. The CE-2W offers reissues of the circuits for the landmark CE-1 and CE-2 as heard on virtually every radio hit of the new wave era. While there are plenty of stellar chorus options available from your favorite boutique makes, it's hard to argue with the authentic old-school tones of this Wazacraft pedal. It seems like every year or two, a new boutique overdrive comes along laying claim to the throne of tone creaminess. In the recent past, there was the Paul Cochrane Timmy and Emerson EM-Drive. This year the Friedman BE-OD hit the market. Unlike these other more "transparent" overdrives, the BE-OD builds on Dave Friedman's reputation as one of the world's premier boutique amp makers. This pedals seeks to replicate the tones of Friedman's OD-100 amp. If the surge in sales we've seen since its launch is any indication, it does this quite well. And in case you missed them, the products below were also well-covered and generated buzz in 2016. Click through for more info and great deals. For some of these, there's even a stable used market emerging. Orkin, Dan. "The Most Hyped Music Gear of 2016." Reverb.com. 2016. Accessed November 29, 2016. https://reverb.com/news/the-most-hyped-music-gear-of-2016.